A) Soybean lecithin is a source of phospholipids and glycolipids which form the plasma membrane (cell membrane). The molecules of phospholipids in the plasma membrane are in a constant state of change. 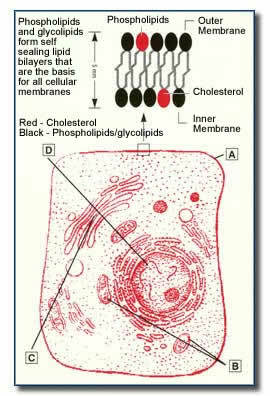 As the cell ages, cholesterol molecules displace phospholipid molecules in the plasma membrane, making the membrane less fluid and more rigid. This causes the cell to lose function and become metabolically inefficient. Increased levels of phospholipids from dietary soybean lecithin supplementation can reduce cholesterol displacement.This restores the elasticity and function of the membrane. B) The intracellular mitochondria are also bound by a lipid membrane and are the power plants of the cell, producing ATP by oxidation reaction, which is dependent upon adequate amounts of B vitamins and CoQ-10. Just as normal aging changes the ratio of phospholipid and cholesterol molecules in the plasma membrane of the cell, free radicals produced by oxidation also damage the membrane of the intracellular mitochonria. Vitamin E and CoQ-10 are effective in helping control the damage from these free radicals. C) Golgi apparatus and vesicles including Lysomes and Peroxisomes are also bound by a similar phospholipid membrane. D) The plasma membrane of the cell nucleus is also a phospholipid membrane.